It is not easy to set up a perfectly exact ranking of the world´s most expensive wines, because the market is constantly in motion. But anyway, we have to try our best. The notion of garage wine covers world-class wines, which are produced by several acres of mini estates, in a very limited bottle number. The price of thes kind of wines used to be really high: one butelia of a garage wine costs around 500-1000 euros. Often they are offered for sale by auction houses, and the collectors are mad about them: they used to bargain on them as they were famous, valuable paintings. 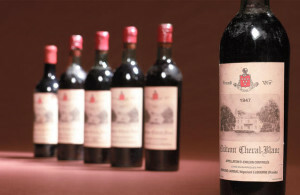 The most expensive wine got under the hammer in 1985: it was a Chateau Lafite Rothschild from 1787 bought by the American Forbes magazine’s publisher for an amount of money which equals to 210000 euros. Thomas Jefferson`s handwritten initial adds more to the bottle`s uniqueness, but the authenticity of it is still a subject of debate today. This record has not been overthrown since then, but interesting and extremely high valued items always occur on the market. 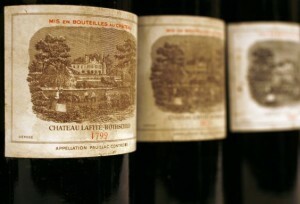 For example in 2006, Chateau Mouton-Rothschild bottles from 1945 were auctioned, for 28700 dollars per piece. The label here also had a role in achieving such a high price, which featured victory over Nazi Germany with the following sign: “1945, annee de la victoire”. These fifty-hundred or more hundred years old wines cannot be really enjoyed -even though Bordeaux wines can be kept for a very long time-, wines from the best vintages may even become “tired”. However, the sweet wines can mean a serious pleasure even at an old age, because the high sugar content also preserves the nectar. 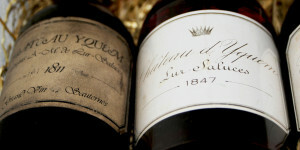 For example, a 1811 Chateau d’Yquem was sold for 73 000 francs at a Swiss auction. The wine was even tasted by wine guru Robert Parker, and rated it at 100 points. Why does the price of an item skyrocket? First of all, because of the media coverage around him. But very low yield, careful selection and handcraft are also the part of the background of luxury wines. In a few exceptional cases winemakers find some very old and rare bottles which were thought to be lost. There are some wineries in the world which specialized to the production of cult wines. The value of these wines does not depend only on their taste and quality, and the name of these brands have a serious prestige which sounds good and commands respect in the whole world. Wines on auctions are the ones from the peak years, which can be matured very long and which are evaluated the highest scores possible by renowned wine experts. If the media is involved enough, the value of the wine is just increasing. Screaming Eagle is a tropical wave that resembles the head of an eagle. And the name of a winery which produced an extremely rare and expensive wine, namely the most expensive wine ever: a six liter bottle of this Sauvignon was purchased for 500000 dollars at a charity auction in Napa Valley in 2000. No other wine in history was sold for more than this one. According to the rumors, Chase Bailey, a former Cisco Systems executive was the one, who bought the bottle. The winery takes place in Oakville, California. Their wines are regarded as cult wines, due to the small quantities they produce and the high prices. The wine has cassis, jammy berries, chocolate, blue fruit and plums notes on the nose, while the palate is dominated by plush and round fruit. Screaming Eagle is not about power, it’s about elegance, purity, finesse and subtle textures. Chateau Cheval Blanc (which means White Horse Castle) is a wine producer in Saint-Emilion in France`s Bordeaux wine region. The 41 hectar vineyard consists of 57 % Cabernet Franc, 40% Merlot and small parcels of Malbec and Cabernet Sauvignon. The area has a complex terroir that consists of 3 different soils. The 1947 Cheval Blanc is widely acclaimed as the most expensive sold bottle of wine in world histoy at 304375 dollars. “It was without doubt one of the greatest Bordeaux of all time, not only for its rare quality but its longevity, in that it can still be kept for another 50 years without any problem.” said Mr. Ganne, the man who was among the lucky privileged few that could taste this grandiose wine. 1947 was a very hot year, which resulted in very concentrated aromas and maturity which complemented well it’s usual silkiness and complexity. The estate does not wait until the phenolic ripeness of the grapes during harvest. They blend the fruits at different levels of ripeness which results in the complexity of the Chateau Cheval Blanc wines. Chateau Lafite Rothschild is a wine estate in France, founded and owned by the Rothschild family since the 19th century. “Lafite” is originated from a Gascon term “la hite”, which means “small hill”. The Chateaux was among the first wine producers who received First Growth status in the 1855 Classification. 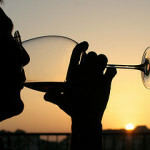 Since then, the are continually producing one of the world`s most expensive wines. The vineyard is among the biggest in the Médoc region (107 hectares), and the production is around 35000 casaes per year. The parcels are divided into 70% of Cabernet Sauvignon, 25% of Merlot, 3% of Cabernet Franc and 2% Petit Verdot. Chateaue Lafite is very popular among the nouveau rich of China, but some say that the 70% of available Lafite wines are actually fake in China. This wine has a fantastic length, body and structure with notes of cedar and graphite. A lovable idiom about this legendary wine says “Il fait la queue du paon”, which means “it spreads out like a peacock’s tail”. Chateau d`Yquem was the only winery from the Sauternes region which received the Premier Cru rating in the Sauternes region, which is rather known for it`s white wines. In fact this estate is one of the most prestigious and highly sought after Chateaux in the world. The majority of white wines are not meant to age, moreover, most of them expire after a few years in the bottle. But Chateau d`Yquem is an exception, this miracle is really shows it`s better side with aging (it can be kept for a century or more with proper care). Robert Parker rated it with the “ultimate” 100 points. It has high levels of residual sugar in the wine and acidity protecting it from spoilage. The wine`s character and complexity is unique. The attack of the “noble rot” (Botrytis cinerea) plays a principal role in the success of these noble drinks. An elegant bottle of 1811 Château d’Yquem was sold for 75000 dollars, thus becoming the most valuable bottle of white wine in the world. Chateau Margaux was founded in the famous Bordeaux region of France, and was among the first wineries which achieved Premier cru (first growth) status in the Bordeaux Classification of 1855. The estate is located in the commune of Margaux in the Medoc region. The vineyard has 107 hectares and produces around 35000 cases annually. Thomas Jefferson bought this wine for 225000 dollars to expand his private collection. After him, William Solokin became the next owner. According to the legend, he brought the precious bottle to a Margaux dinner, where the waiter accidentally broke it. The insurance company had to completely recompensate Mr. Solokin. I would not have been in the place of the waiter. 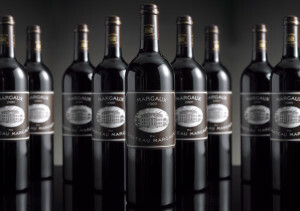 Chateau Margaux wines are famous for their legendary silkiness, their consistency and good aging potential. Romanee-Conti is a Grand cru vineyard in Burgundy, France, with Pinot Noir being the dominating variety. The key to the success and the high quality is extremely low yield (35 hectoliter per hectare, which means that three Pinot Noir grape vines are used for on bottle of Romanee-Conti) and the longevity of the vines(the average age of the vines is 53 years). Their wines are among the most expensive and prissy wines in the world. 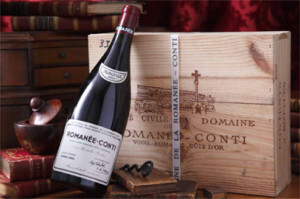 In 1996, an eight bottle case of Romanee-Conti DRC 1990 was sold for 224900 dollars at an auction at Sotheby’s in London. There is one more factor that contributes to the price of these wines a lot: the rarity, which is due to the little quantity of production. This is typic of Burgundy wines, in contradistinction to Bordeaux wines, which usually are grown on extra big estates. The uniqueness of Burgundy soil gives a silky balance and a typical earthiness to these wines, which makes them really individual an interesting. I hope that your perspectives on the most expensive wines in the world has broadened in a considerable degree after this article. Stay with us and do not forget to read the next article, which will be also about wines, but we will approach the subject a little bit more specifically (we will investigate the French wines). Hang on!